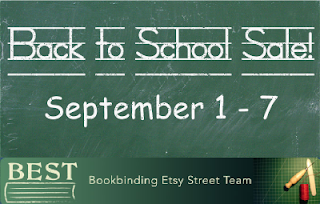 Bookbinding Etsy Street Team: It's time for our Second Annual Back to School Sale! It's time for our Second Annual Back to School Sale! The following team members are participating in the Back to School Sale. The Sale runs from Tuesday, September 1st - Monday, September 7th. Visit the individual shops to get more information about their specific sales and special offers!